Great for an early game with brunch. Start with the dough. Using a mixer, cream the butter and sugar. Add egg yolk and vanilla. Add the flour and salt and mix until dough comes together. It may take a minute. Shape into a disc and place in plastic wrap. Refrigerate until you are ready to roll out. In the meantime, get the filling ready. In a small bowl, whisk together the egg white and water. Set aside. In another small bowl, whisk together the sugar and cinnamon. Set aside. Take out the dough and place on a sheet of parchment paper. Place another piece on top and roll out into an approximately 9X12 inch rectangle. 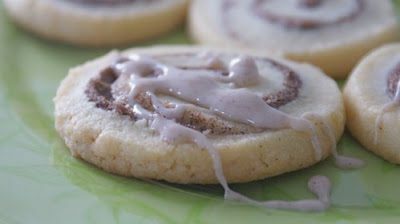 Take off the parchment paper on top and brush on the egg white wash. Sprinkle the cinnamon sugar mixture evenly over the dough. Carefully roll the dough length wise into a log. Make sure you press the edges together so they do not come undone. Roll back into the plastic wrap and place in the freezer for about 30 minutes. (Or refrigerate overnight) Cut into 1/2 inch circles. Place on a cookie sheet lined with parchment paper and bake at 350 degrees for about 15-17 minutes, or until just lightly golden on the bottom. For the icing, mix the ingredients until creamy and smooth. Drizzle over the cookies.